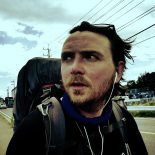 This blog came about in 2014 when I decided to quit my job, sell my house and go on a three month solo expedition down Japan, from Sapporo to Osaka. On my journey I endured freezing mountain roads, dangerously tight tunnels and some of the most amazing views mother nature can produce. I filmed around 500gb of footage and countless photos that I am using to coincide with my journal to help finish my book about my adventure. In the mean time I am planning my wedding, travelling when I can, and spending too much time on Netflix. Keep the adventure going by sharing and inspiring others. What an incredible trip, can’t wait to read up on all the stops! What an awesome adventure and cause. Best wishes to you!